Kylie Grimes competed in wheelchair rugby at London 2012, but is now aiming for a medal in track and field at the World Para Athletics Championships in London this summer. The 29-year-old has switched from a team sport to the individual discipline of throwing and if her recent improvements continue she will be a force to be reckoned with in London in July. Last year she came fourth in the club throw at the Rio Paralympics behind gold medallist and GB team-mate Jo Butterfield. But Grimes had only been seriously training for the event for a matter of months and was up against athletes who had been specialising in it for years. 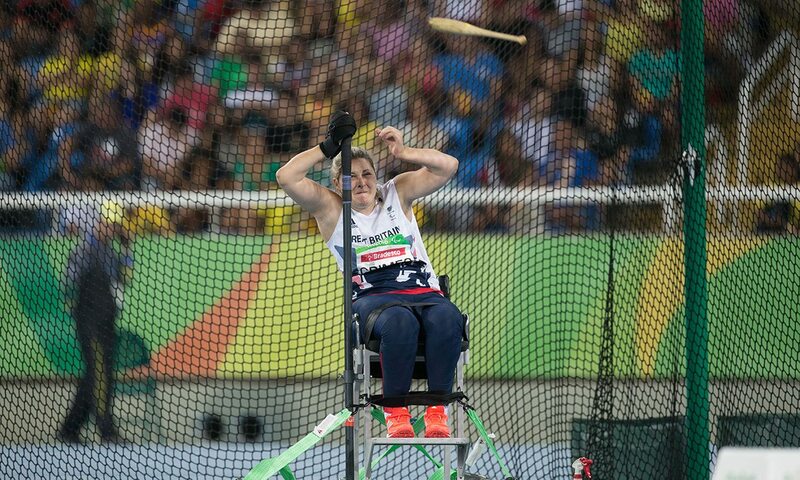 Grimes initially planned to switch from rugby to wheelchair racing but there was no suitable race for her category in Rio, so she tackled the club throw and it proved a successful move. Grimes says she would occasionally get a little frustrated with team-mates who perhaps weren’t as dedicated as she would like and was gradually drawn to the individual element of athletics, where you are solely responsible for your own performance. “I struggled with some team-mates not pulling their weight,” she admits. “I’m quite strong-minded and I put my whole life into my sport. The Farnham athlete was paralysed after breaking her neck after diving into a swimming pool at a friend’s house in 2006 and hitting her head on the bottom of the pool. Yet she is well-known in sporting circles for focusing positively on the future and not looking back in regret. To illustrate her gritty nature, for example, she became one of wheelchair rugby’s few female players and once said in an interview that there was little to fear in the notoriously tough sport after you’ve broken your neck. “I still play rugby with a London wheelchair rugby club about once a week,” she says, adding that it provides a great cardio training session. But her big goal for this year is the World Para Athletics Championships in London and she spent one day recently at Mossbourne Riverside – a primary school which is virtually a club throw’s distance away from the stadium itself in the Queen Elizabeth Olympic Park. PreviousShould you do an extended warm-up?